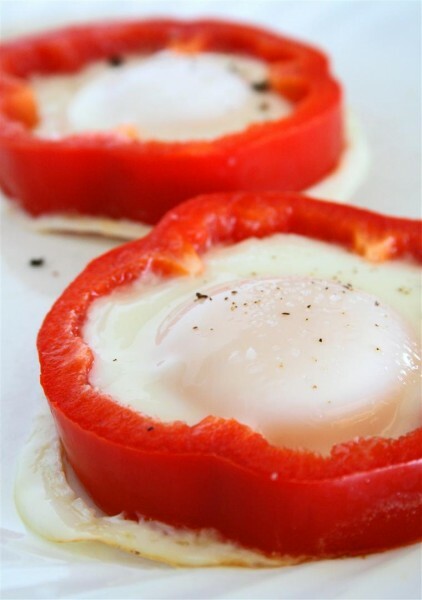 Red Pepper Eggs was posted on August 27th, 2011 and is filed under Breakfast, Kid Friendly, Protein, Recipes. This entry has 16 comments. You can follow any responses through the RSS 2.0 Comment Feed. Happy Saturday guys! Today this isn’t really a recipe post…it’s just a fun little post to show you how I did my eggs up this morning. It’s such a cute way to make them look pretty. Kids think it’s fun. And it’s a great way to prepare eggs when you have guests over…just one of those little things you can do to make things more special. It’s ridiculously easy. 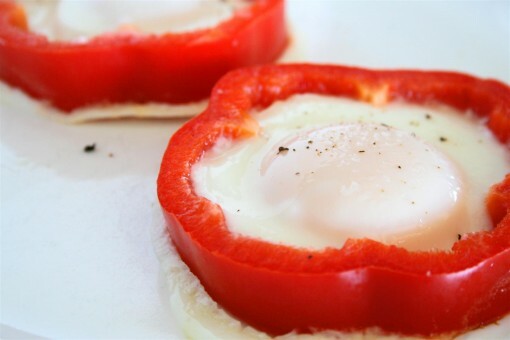 Just slice your red pepper into rings and fry your eggs right in the middle of that ring! Nothing easier. I served mine on a piece of whole wheat toast. I’m pretty sure that I’ll be doing this often! When we have company over, I want to fry up a whole plateful with green, red, and yellow peppers because I think it’d be rawwwther perty. I love details. Anyway, it’s not as boring as the usual. Little things do add spice to life. What are some little details you like to add to make everyday things more special? This is a fun way to prepare your eggs! A nice way to serve eggs! yum! Definitely a fun and easy way to pimp up your eggs.. Love it! What an interesting recipe! I love the take on the simple egg. Yum! I am definitely going to try this next time I make eggs. These are super cute! They really make breakfast feel special! Good idea, the pepper rings looks like a mold, very healthy, light and delicious too. Thank you Charissa. This is really a very innovative idea to serve eggs to the kids! Shall definitely give this a try! !